Joe Biden: Constitution does offer an inherent right to privacy. Joe Biden: Roe v. Wade is as close to a consensus as we can get. Sarah Palin: Constitution does offer an inherent right to privacy. Sarah Palin: Abortion should be states� issue, not federal mandate. Sarah Palin: We should not reward poor financial decisions. Sarah Palin: McCain�s experience makes him best judge in economic crisis. Sarah Palin: I�m a feminist; equal rights for women. Sarah Palin: Equal pay for equal work; but not Ledbetter Act. Joe Biden: Supreme Court wrong to deny federalization of wife-beating. Barack Obama: Rebate checks instead of gas tax holiday. Sarah Palin: When Putin rears his head he goes into Alaskan airspace. Sarah Palin: We cannot meet rogue leaders without conditions. Sarah Palin: Would not second guess Israel if they attack Iran. Sarah Palin: Agrees with Reagan that US is �beacon of light� for world. Barack Obama: Chairs European subcommittee; could hold Afghanistan hearing. Barack Obama: My record on Israel is same as McCain�s. Barack Obama: Appropriate for Israel to take out Syrian nuclear reactor. Barack Obama: Jerusalem should be capital of Israel, pending final status. Joe Biden: Countries without state-church separation are in turmoil. Sarah Palin: Many Supreme Court rulings are better addressed by states. Sarah Palin: No state-mandated religion, but public faith is ok.
Sarah Palin: McCain is maverick who wants to reform government. Sarah Palin: Pakistani people & leaders want to get rid of terrorists. Sarah Palin: Fight terrorism to spread democratic ideals in world. Barack Obama: Inappropriate to lie to public; just don�t answer questions. John McCain: Inappropriate to lie to public; tell Americans what we face. Barack Obama: Disrupting Al Qaeda in Afghanistan prevented another 9/11. John McCain: Credit Bush, troops, & luck, for not another 9/11. Joe Biden: Models his role on LBJ�s vice presidency. Joe Biden: Favorite movie: �Chariots of Fire�, for real heroism. Sarah Palin: Admires Geraldine Ferraro & George Bush Sr.
Sarah Palin: Favorite movie: �Hoosiers�, for underdog tenacity. John McCain: Governors Clinton & Reagan were underestimated too. Barack Obama: Favorite movie: �The Godfather�, for respect & family. John McCain: Favorite movie: �Viva Zapata�, a heroic tale of sacrifice. Sarah Palin: Surge needed in Afghanistan; we cannot afford to lose. Barack Obama: Situation has improved in Iraq; but it�s still fragile. Barack Obama: Surge reduced violence; but distracts us from long-term goal. Barack Obama: Engaging in tough diplomacy with Iran is a sign of strength. 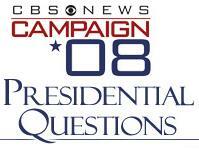 The above quotations are from 2008 CBS News presidential interviews with Katie Couric.